We all know that, to keep an audience’s attention, we need to throw everything at them. Right? It’s an easy mistake to make, but in fact what will bring you success as a speaker is keeping it simple. Say less, but make it stick more. Don’t move so much, but do so more confidently. Speak more slowly, and with greater emphasis. This less-is-more approach works because we all have limited capacity to absorb information. This means that you need to focus very clearly on your most critical messages – and reduce the distractions that surround them. If you keep things simple, your audiences will remember what you want them to take home from your speech. First and foremost, then, hone your presentation. Don’t try to squeeze too much in. The cardinal sin of public speaking is being boring – and often that results simply from trying to tell your audience too much. Remember, you’re a speaker … not a lecturer! Focus, then, on just a few key points and deliver them well. Use colourful anecdotes and a very clear structure to help your audience grasp what you’re saying – and why. Open with a good “scene-setter”, which puts in a nutshell what you’re going to talk about, or an attention grabbing statement that piques their curiosity. Use signposting to make the progress of your presentation clear. Keeping all this simple helps you avoid rambling. Pausing will help you add emphasis to your crucial messages – and remember, sometimes silence is the speaker’s best friend. Again, you don’t have to fill every second! Pauses help pace. They give you time to think, and will help you come across as confident. In fact, clarity in general will go a long way to convincing your audience that you know what you’re talking about. 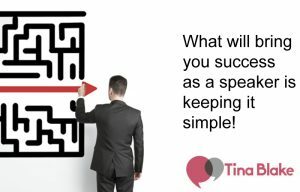 Keeping it simple will clear away the clutter from your speech – and give it both direction and momentum. In other words, simplicity is a no-brainer: it pleases your audience, makes your pitch stronger, and gives you an easier time, too! So, next time you are preparing your presentation, embrace the virtue of simplicity.